I saw a something on a sidebar that said "rejected muppets." The link failed to provide the twisted pleasure I expected, but it started me thinking about what a failed Muppet might look like. To be blunt, not everyone is a Kermit the Frog or Miss Piggy. It's the hard, sad truth - competition must be fierce. Are there long lines of puppets who want to take that next step and be muppets? It's surely a marionette mash-up, a virtual hand-all-up-in-there smack down. Muppet Fails must be the lost souls of the Muppet World. 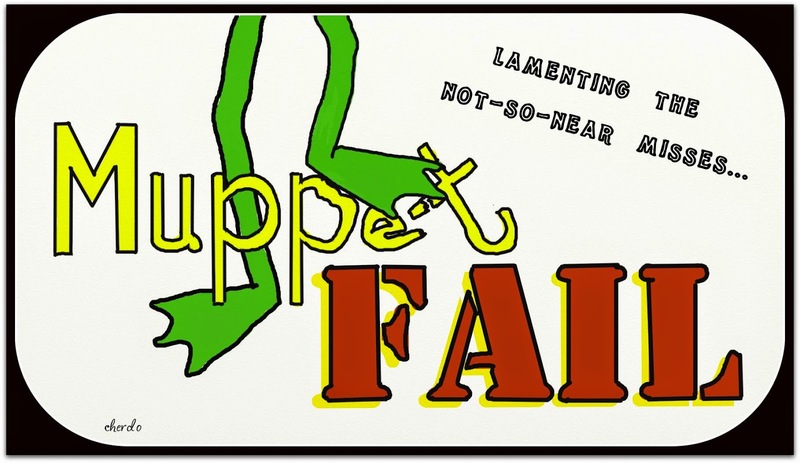 I wondered: why would a Muppet Fail? Is there a prevailing puppet prejudice against hip, continental and ecologically aware felt creatures promoting education, or at least the first letter sounds? 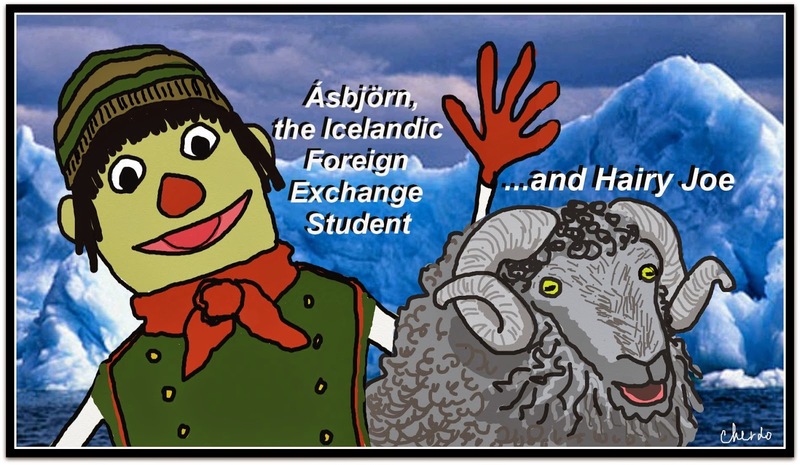 Ásbjörn the Icelandic Foreign Exchange Student seemed like a winner from the start. Obviously, the backstory was that this kid was a go-getter who valued education. As a foreign exchange student, he had committed to a challenging change of pace for a year as he studied alongside American students. Surely he had wonderful stories to share with the kids about his homeland. With his pale, ethnically confusing pallor and jaunty Icelandic coat, you had to ask yourself: what's not to like? Even with the alarmingly realistic details about his lunch (sheep head, fermented shark, bread that's been buried near a hot spring to bake...and smells like sulphur), test audiences loved him. Observers imagined the smell of mackerel every time they observed his audition - he was that good. So what went wrong? I'll tell you: Ásbjörn had a sidekick, Hairy Joe. Hairy Joe never clicked with audiences. You either love yellow demon eyes or you don't; it's a polarizing look. The twisted horns reminded people of...well, you know who. The look on his face never changed: yellow eyes, staring ahead, mouth gaping open...steam rising from his lips. Hairy Joe never met a comb. He had an odd smell, more like a real mountain goat that a felt covered prototype. Ásbjörn tried to cover for him, but the constant awkward attempts were embarrassing and contrived. "Hairy Joe is very pleased to meet you" or "Hairy Joe is so glad to be here in the greatest country in the world" proved useless. Come on...do you think the casting staff was björn yesterday? Ásbjörn and Hairy had to go. They were MUPPET FAILS. 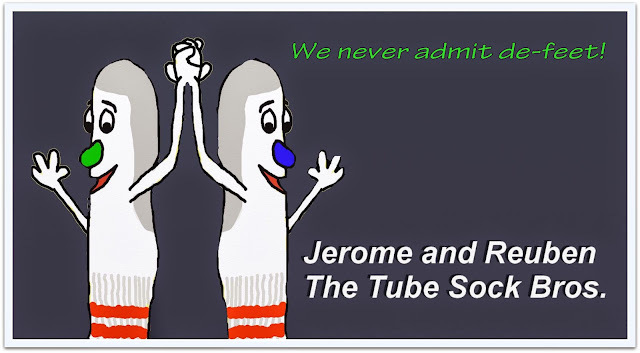 The next wave of potential muppets brought The Tube Sock Brothers, twins Jerome and Reuben. Their backstory was that they were boxers. Everyone went nuts! Lawyers got involved. Apparently, you just don't tell people you are boxers unless you are underwear. It's confusing to impressionable youth and and the next thing you know, you have the lawsuits piling up. Kids and pre-teens start wearing socks for underwear while claiming they were misled and confused by Jerome and Reuben. It seems to me that when the kids were dressing they would be left with a pair of underwear that didn't have a job; perhaps that might even clue them in to the fact that the socks had another purpose. "Hey, locker room, where's your brother?" "Why DON'T you admit de-feet? Isn't that what de socks are for?" "Oh, for crying out loud, it's just a pair of tube socks!" "Sock it to him and put him out of his misery - he'll never be a muppet." Prophetic words; they never were. Another case of MUPPET FAILS. Abby Crabby, Two-headed Monster, Count Von Count, Aloysius Snuffleupagus, Tiny Little Super Guy and Stinky...there's a sock that wants to BE you. A muppet fails when he wants to be a dentist instead of muppeting. It's just like the elf in the Rudoph special that was on during December every year when we were growing up. Na na na na na. You can't make me go to bed. Put your footie jammies on and get in that bed, Janietha Josephine Junebug! One of our favorite holiday pastimes is do impressions of all the characters from Rudolf the Red-nosed Reindeer! We have imitated the elf for years. "But I want to be a dentist," said in a wistful manner. The Hurricane made me laugh so many times when we were talking about career possibilities and she suddenly turned into an elf who wanted to be a dentist. I like my new name. It's so sophisticated. We don't wear footie jammies in Florida. I sleep bare bottom nekkid. I will never knock on your door unannounced. We sing, "why am I such a misfit?" out of tune and LOUD. Shecky Shady Shaft, the Nookie Monster of blogging! A-ha! Gotcha! Janie wasn't the only one who stayed up past her bedtime again last night. You were up late, too, Cherdo! The proof is in the 12:39 am time stamp on your reply to a comment on yesterday's post. 20 minutes till one on a school night? What am I gonna do with you young ladies? Must I put you across my knee? CAN I put you across my knee? 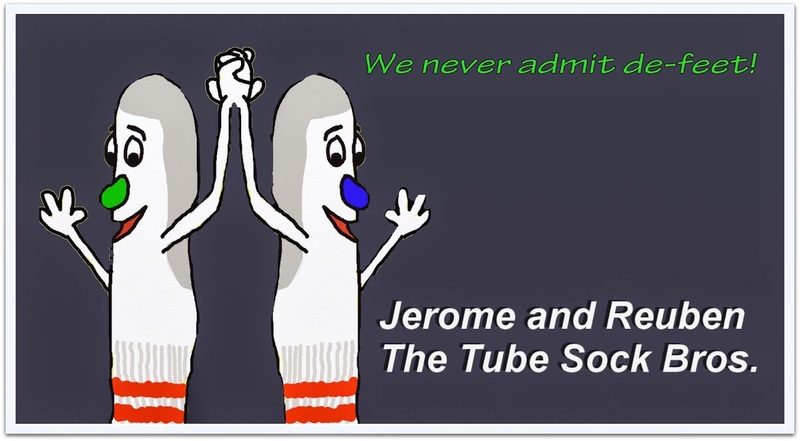 I can totally relate to Jerome and Reuben, The Tube Sock Bros. I've been wearing tube socks as underwear since the age of 13. Nookie Monster, ha ha ha. A thrillin' Thursday to you, Shadzilla! I'm laughing so hard I am again in danger of choking or peeing. Don't you find it rather odd that Shady monitors the time stamps on our comments? Doesn't he have anything better to do? And I do not skype with him at night. We skype during the day. Tube socks as underwear--good heavens. You shouldn't have told Shady about my singing. Now he'll expect a song, too. I don't think I know anything naughty enough for him. Sing a nice song and make him choose the to be a good boy. Don't give him naughty ideas...he has plenty. Haha! The Tube Sock Bros. That's cute! But I can see why they'd be Muppet failures. The powers that be are just prejudiced, trying to keep them in the laundry bag or the hamper of heartbreak. I really like the thought and originality that when in to this. Thank you, dear. Keepin' it weird. So...Captain Condom probably wouldn't have worked. Not really a 100% cotton success story...so, no. Yeah, cotton's probably a no-go from the start. Except for Catholics, I suppose. Die Welt braucht mehr deutschen Comedians. Deutschland braucht mehr deutsche Komiker . Excuse any poor form there, ha ha. My verbs might need re-located. Hi Cherdo, first time visitor. I wonder if I should move forward with my Unicorns in Uniforms idea. Maybe not. I encourage any and all creative pursuits, but especially the ones that involve mythical creatures, 24/7. Keep me posted... ;-) Thanks for dropping by, Stephen! This made my day. :) Too fantastic. Though I kind of like Hairy Joe...poor thing. Then the time was well spent! I rarely make ANYONE'S day! I like these!!! I grew up on The Muppets--back when they had their own prime time TV show. It kinda sucked but for a kid, it was awesome. This may have to be a regular feature of the Flipside, ha ha. BWAHAHAHAHAHAHA ... that is the best line of all, Lisa! I love, love, love that.